Electrophysiology Market size is set to exceed USD 6.5 billion by 2024; according to a new research report by Global Market Insights. Increasing prevalence of cardiac arrhythmias will act as primary driver for electrophysiology market. According to CDC data, around 2.7 to 6.1 million people in the U.S. suffer from atrial fibrillation. Elderly people are more prone to suffer from cardiac arrhythmia as atrial fibrillation cases increases with age. Rising market penetration of ablation and diagnostic catheters in developing countries of Asia Pacific and Latin America will positively impact industry expansion. Technological advancements in electrophysiology devices such as ablation catheters and devices used for mapping and navigational technologies will escalate adoption rate, thereby fueling industry growth. Growing preference towards early disease diagnosis and treatment will further accelerate demand for electrophysiology diagnostic catheters. Moreover, on-going research activities pertaining to investigating appropriateness and applicability of different ablation modalities to treat and reduce recurrence rate of cardiac arrhythmias should boost industry size growth over the coming years. However, dearth of skilled electrophysiologists, high cost and high reuse rate in countries such as India will hamper business growth during the forecast period. Product segment of electrophysiology market includes ablation catheters, diagnostic catheters and electrophysiology laboratory devices. EP ablation catheters held largest market share of around 48.2% in 2017 owing to increasing prevalence of atrial fibrillation, technological advancements and growing application of ablation catheters for cardiac rhythm management especially in developing countries such as China and India. Rising number of baby boomers will significantly contribute to industry growth. Elderly people, more prone to suffer from atrial fibrillation will drive atrial fibrillation indication segment, leading to 5.7 % CAGR during the forecast period. Atrial fibrillation is more common in people suffering from hypertension, heart valve disease, cardiomyopathy, chronic obstructive pulmonary disease (COPD), diabetes and others. Occurrence of such diseases will augment incidences of atrial fibrillation, thereby stimulating demand for ablation catheters. U.S. electrophysiology market dominated the global industry with around 32% market share in 2017 and is estimated to show lucrative growth during the forecast period. Technological advancements coupled with increasing research activities pertaining to development of innovative ablation techniques will drive U.S. electrophysiology market. Rising awareness about early disease diagnosis and treatment along with rising number of people suffering from cardiac arrhythmia condition such as atrial fibrillation in the country will further accelerate industry growth. 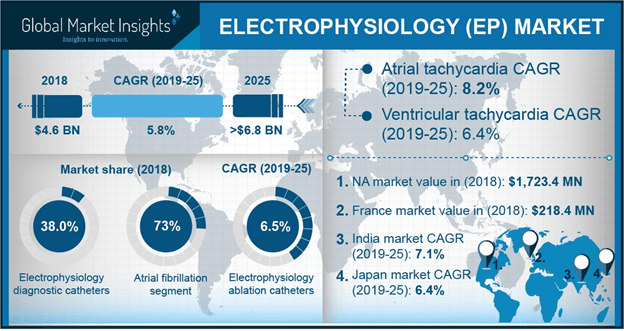 Increasing geriatric population and rising prevalence of cardiac arrhythmias will act as major driving factor for China electrophysiology market. Electrophysiology catheter ablation is one of the most commonly performed cardiovascular intervention in the country. Expanding reimbursement levels coupled with favorable government policies will positively impact industry growth. Some of the notable players operating in electrophysiology market are Johnson & Johnson, Japan Lifeline, Abbott Laboratories, Stereotaxis, Topera, Magnetecs Corporation, Koninklijke Philips, Boston Scientific Corporation, Biotronik SE & Co. KG, Microport Scientific Corporation, GE Healthcare, Medtronic, and Siemens AG. Industry players are focusing their efforts on superior product development to fulfil growing demand for advanced devices as well as consolidate market position. For instance, In August 2018, BioSig Technologies announced U.S. FDA clearance for PURE EP system, designed for digitizing, acquiring, filtering, amplifying, displaying, measuring and calculating, recording and storage of intracardiac and electrocardiographic signals for patients undergoing electrophysiology (EP) procedures in an EP laboratory.